Australia is no stranger to high temperatures and dry heat. In fact, 70 percent of the Australian mainland is classed as arid or semi-arid, receiving less than 70mm of rain each year. The past few years, however, have been some of the driest in the history of the country. An article published in The Conversation in May asserts that the droughts of the late 20th and early 21st centuries in southern parts of Australia are the worst in the last 400 years. Indeed, many farmers are saying that this is the worst drought they have ever seen in their lifetimes. On the other hand, experts have said that whilst it is severe, it is not the worst – at least not yet – calling back to what is known as the Federation Drought, which occurred from 1895 to 1902, during which the Darling and Murray Rivers ran dry, and the Millennium Drought, which occurred from late 1996 to mid-2010, severely affecting most southern cropping areas. 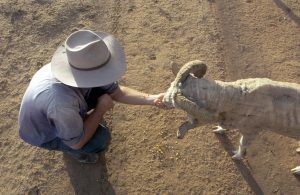 Whether it is the worst drought to have ever hit the nation or not, “The Big Dry”, as it is referred to, has already affected all of New South Wales and 60 percent of Queensland. Parts of NSW have had the lowest rainfall on record, receiving less than 10mm of rain in July, and experts have forecast drier-than-normal conditions for the state over the following months. Australian weather conditions can vary widely from one year to the next, and since it is difficult to pin down one particular factor as the cause for drought and predict when it is likely to happen, most farmers know enough to prepare for it well in advance. They set aside cash, store fodder in good years, and destock when necessary during lean years. Nevertheless, even with all their preparations many farmers are now struggling with failing crops, severe water shortages, and inability to feed their livestock as the dry period lingers. Then there are those who are less efficient at planning for drought. In any case, those who don’t have money struggle to buy feed, and those who have money struggle to find feed to keep their livestock alive. Even facing seemingly insurmountable hardships, many farmers are reluctant to leave their land, especially if these have been in their families for generations. Demand for feed and dwindling supplies are driving costs up. More and more farmers are having to order their hay from interstate, resulting in freight bills that often are worth more than the feed. Others are turning to alternative food sources, such as cotton seed; however, demand for this has also gone up as supplies are running short. Some producers have gone so far as to experiment on orange peel for fodder. Agriculture plays a vital role in Australia’s social, economic, and environmental sustainability. Whilst agriculture covers only 58 percent of the country’s land mass, the sector is worth more than $63 billion (2016-2017). It comes as no surprise then that the drought assistance from the NSW government has reached more than $1 billion. Farmers are eligible for annual relief payments of up to AUD 16,000 each, and additional payments of up to AUD 12,000 were also announced in August. Millions more have been raised by private corporations and individuals to relieve the plight of those most affected. Still, farmers are struggling to cope with the devastating consequences of the drought. What we can do as rainfall deficiencies persist? The Australian Bureau of Meteorology moved to El Niño Alert in early October, with model outlooks and observations indicating there is roughly 70 percent chance that El Niño will develop in the coming months. “An El Niño basically means that as we get into summer there’d be less chance of having those recovery rains that we need and we may have to wait till autumn in 2019 to start seeing some recovery rains in the drought areas,” Andrew Watkins, manager of long range forecasts at the Bureau of Meteorology, told Reuters. With no end in sight for The Big Dry as yet, we Australians will need to continue to band together to provide relief for those suffering – we cannot afford not to. Let’s do our part by giving to charities like RRT, Red Cross, or any organisation of your choice, that seeks to fill the gaping need left by this drought.